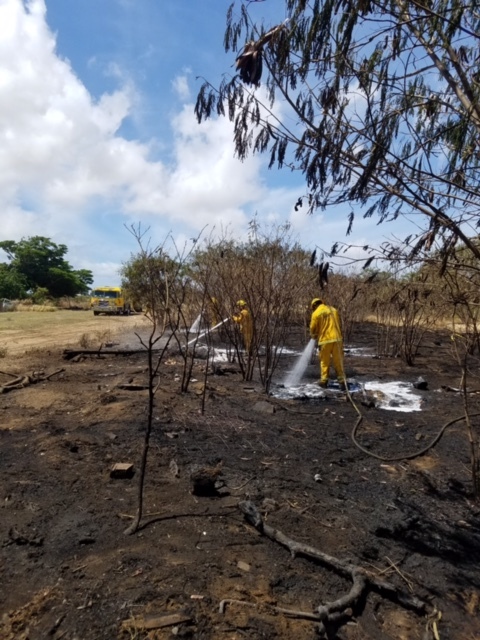 Maui firefighters were called to reports of a brush fire located between the Maui Lani Golf Course and Makali’i Street in Kahului at around 10:10 a.m. on Friday, Aug. 3, 2018. Engine 10 and Tanker 10 from Kahului responded. On scene, crews found a working brush fire located about 40 feet behind homes on Makali’i Street and running towards the golf course. Crews were able to access the fire through an access off of Kuihelani Highway and quickly achieved containment.